Allow us to add that special touch to your wedding, memorial service, or celebration! Let us help you make your wedding be the one that everyone remembers and talks about for years to come! White Doves can represent eternal life, love, happiness and unity. They signify the celebration of the beginning of your new marriage together. This is a unique way to express that special love and joy you are feeling on your wedding day. Including a white dove release will add something special and be a completely unique experience everyone remembers. Our graceful pure white birds soaring up and circling overhead will surprise and awe your guests with their unexpected beauty. White doves are available for display and pictures may be taken with the Bride and Groom. A white dove release is a unique and thoughtful gift alternative in lieu of flowers. Many times when a loved one passes we are left with a sense of emptiness and uncertainty of what to do. We find ourselves torn between surrendering our loved ones life and God's promise of a much better life after death. A grave side dove release presents a quiet moment of reflection and comfort. It gives closure and a sense of enlightenment that the Spirit has lifted and become free. 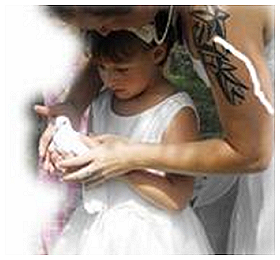 Dove releases for Funeral & Memorial services typically take place at the closing of the grave side service.If an alternative service is chosen a dove release can be performed outdoors after the service at the funeral home, church, chapel, or any other place the memorial is held. Our pricing structure is based on the distance our birds must travel to get home from the release site. The longer it takes them to return safely home determines the price of our services. The area we currently service is the Great Lakes region - Saginaw, Flint, Pontiac, Detroit Metro, etc. What happens to the doves after release? They usually circle a few times to get their bearings, and then fly home to the comfort of their loft. Do all doves know how to fly home? Our birds have spent many hours in training and when they are released the know how to fly home. How do they know where home is? Nobody really knows. A well-trained bird appears to use many senses to navigate. Although not clearly understood, their ability to navigate depends on breeding, good health and extensive training with a knowledgeable handler. What time of day is best for a release? The specific time is flexible but we never release doves less than one hour before sunset.